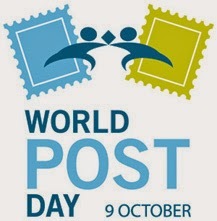 The World Post Day will be celebrated all over the world tomorrow. In India it will be a part of the National Postal Week till 15th October 2014. On 10th October it will be the Savings Bank Day, on 11th the Mails Day, on 13th Philatel Day. 14th October will be observed as Business Development Day and on 15th as Personal Life Insurance Day when insurance claims settlement will be given priority with the name to bring down pendency in claims settlement to zero. On all the days school children will be involved to educate them on functioning of the Postal Department. Customer Forums meeting will also be held in various postal circuits.